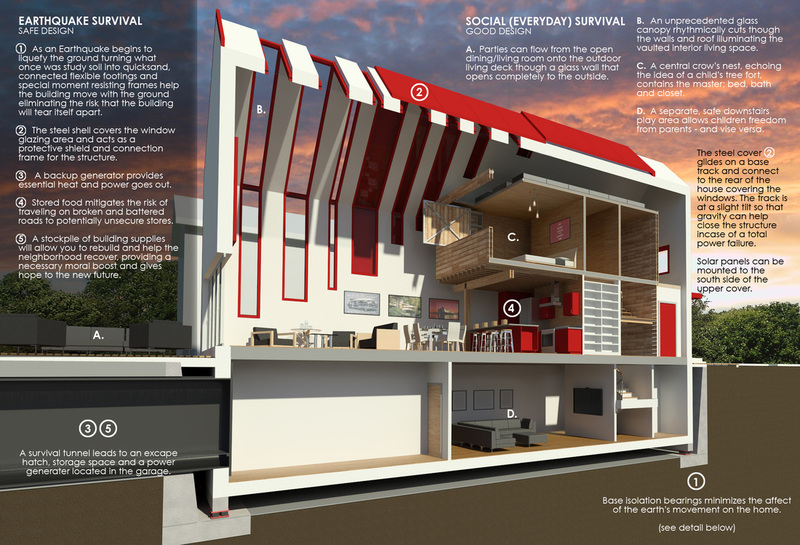 Imagine homes that can actually do work. Homes that gather their own water, provide their own light, create their own electricity, and grow their own food; all-the-while, designed to delight the senses and lift the spirits. Now imagine these same homes with the ability to protect you from common natural disasters. 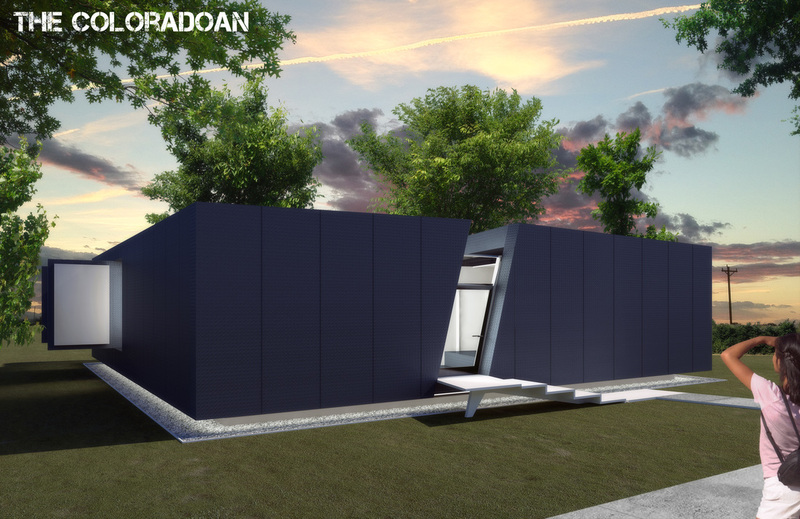 This design for Flood House stems from the members of F9 Productions having lived a part of their lives in the flood prone region of Fargo, North Dakota. 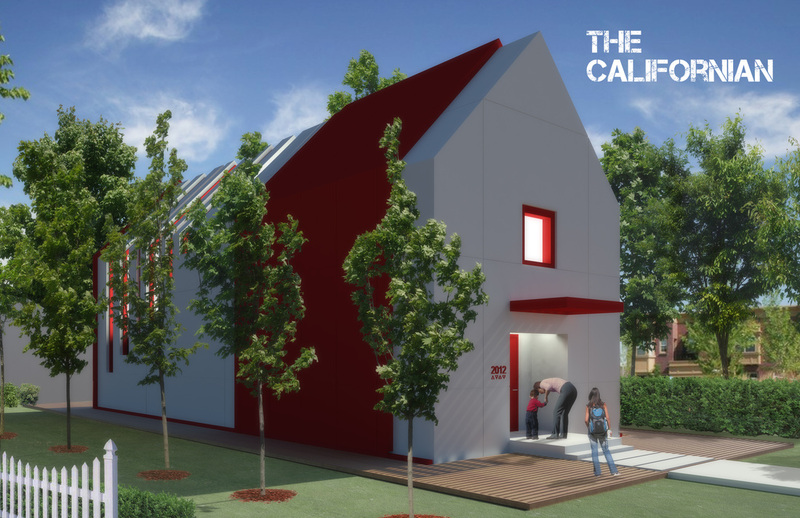 F9 Productions started thinking of the catastrophe that could strike if the flood dikes gave way and for that reason they designed a flood resistant house that takes on the challenge of how to survive in the worst conditions. A raised home design elevates treasured items away from rising waters. 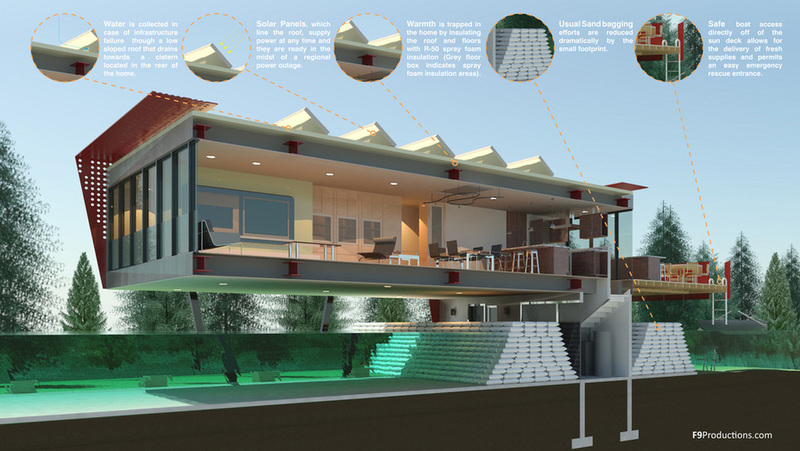 The house is built upon elevated ground that is high enough to protect the main level from any flooding. Protection is maintained by steel siding guarding the house from falling debris, and also acts as a shield against large floating objects. Harsh east and west light is filtered though operable steel curtain panels. Intense summer light is also dappled though the horizontal sun screens. Summer entertainment can take place on the outdoor Sun Deck which includes: a fire pit, a bar and grill, and a table for dining. Section Perspective: 1) Water is collected in case of infrastructure failure through a low sloped roof that drains towards a cistern located at the rear of the home. 2) Solar Panels line the roof, supply power at any time and they are ready in the midst of a regional power outage.3) Warmth is trapped in the home by insulating the roof and floor with R-50 spray foam insulation. Grey floor box indicates spray foam insulation areas. 4) Sand bagging efforts are reduced dramatically by the small footprint. 5) Safe boat access off of the sun deck allows for the delivery of fresh supplies and permits emergency rescue entrance. Interior Image: 1) Privacy is provided by using translucent glass on the lower part of the windows. 2) Supplementary heat is supplied to the home thought the gas fireplace. 3) A storage wall provides a cozy resting place for extra blankets, pillows, china, glassware, and toys. 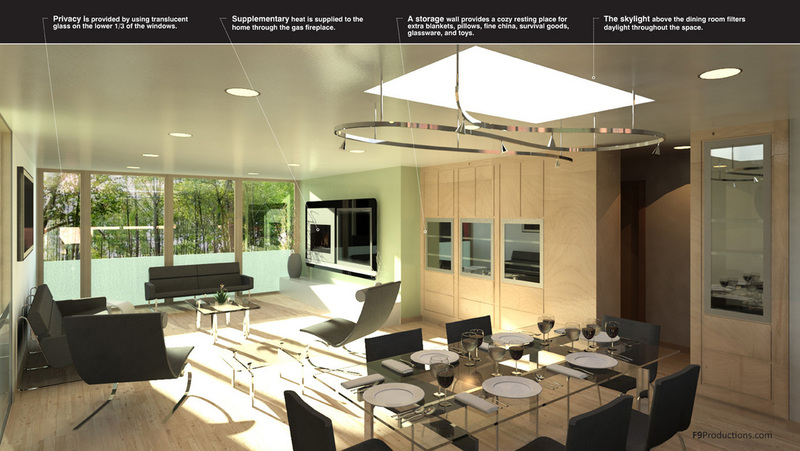 4) The skylight above the dining room filters daylight throughout the space. Custom homes designed and built today are typically rectilinear often evoking a synthetic feeling. The form of Genesis , however, appears to be sculpted by the wind and mimics natures fluidity with an organic shape. 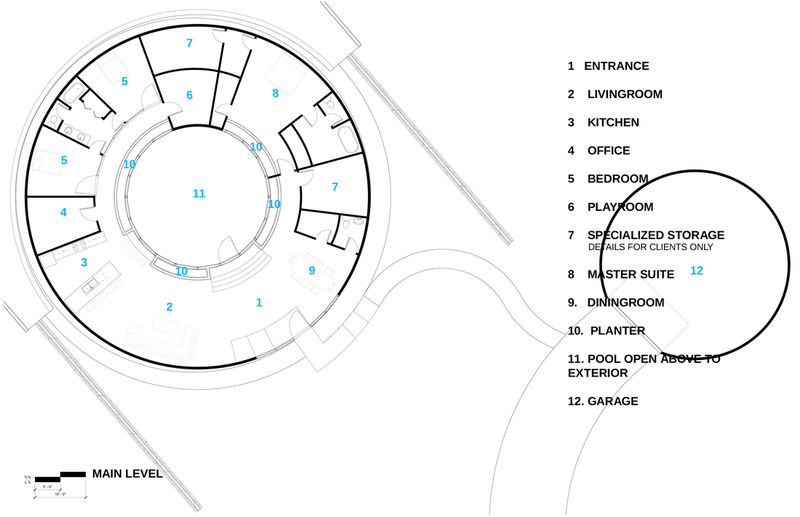 The circular floor plan has been designed around a central swimming pool, encapsulated by glass and lush vegetation thus providing each room with view of the circular pool. Click the play button above to see Genesis retreat below. 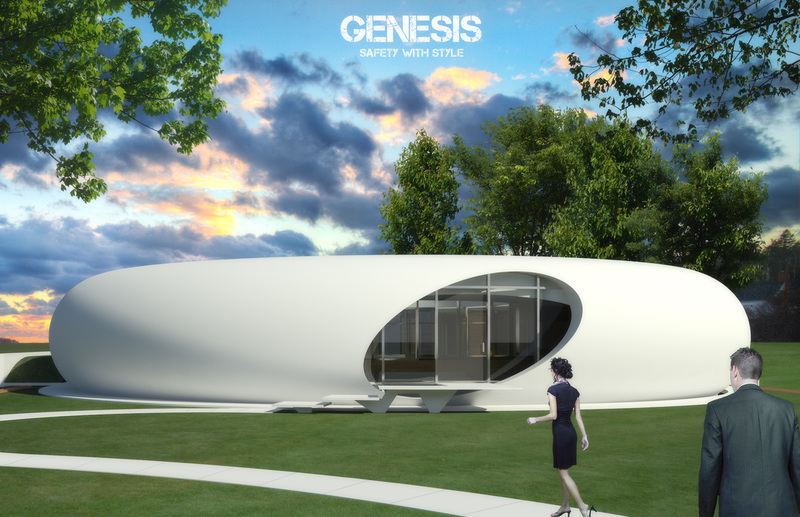 The Genesis home is also designed with the ability to escape any kind of above ground catastrophe by burying itself underground to provide a nearly impenetrable level of security. A blast proof concrete cap covers the structure while the home connects with its own underground survival system that includes; security tunnels, life support systems, tools, materials, and resources for building a new future. Genesis is a new beginning. (see the animation left and image below for more detail). The Californian is a unique custom home with high ceilings, an abundance of windows that provide bright natural light, with a great view. This modern design incorporates high-end finishes that will delight your guests, warm up your life, and at the same time protect your and yours from natural disasters; specifically, earthquakes. See the image to the right for full details on this home's earthquake protection systems. This home has been designed around a childhood dream - living in a tree fort. The house features an open main floor plan with an elevated wood that encases the master suite. The tall vertical windows continue up and through the roof creating an unparalleled experience of sunlight that constantly cascades along the interior wall surfaces. Upon entering the Californian, you are immediately met with a bookshelf that disguises a secret passage to the powder room. The Kitchen (2) is nested under the inset Master Loft (6) on the second floor. This wood clad interior structure provides a master suite fireplace, a glass encased Jacuzzi tub, swinging doors leading to an over look of the open floor plan below and view to the outdoors. Downstairs is the kids domain with 2 bedrooms, a playroom, and a bathroom This space is perfect to make their own. Click the play button to see how the Californian protects itself with built-in armor. Mountain forest fires in Colorado are a severe threat, hence this home's derived name, the Coloradoan. The striking center skylight acts as this home's organizing feature. It's diagonal shaft of natural light illuminates the heart of the Coloradoan and provides plentiful sunlight for internal organic garden. This large home also offers more space for a playroom, an office, a game area, a theater space, an exercise area, and the survival storage that includes a library and plenty of supplies to rebuild after a disaster. 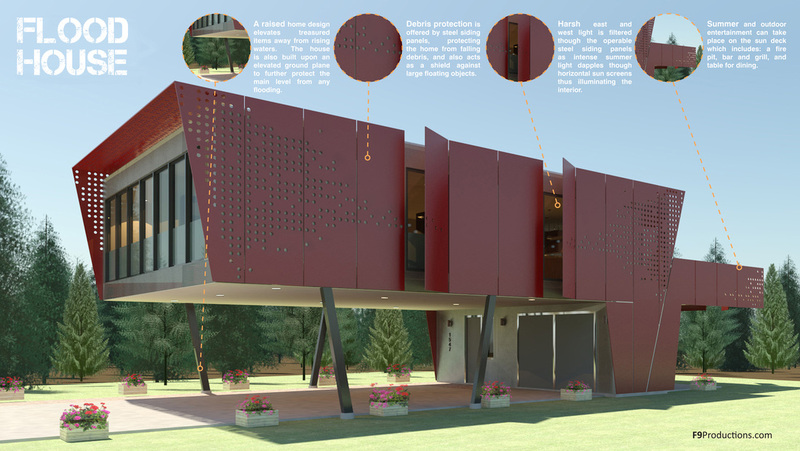 The seed home was designed with ability to protect itself from natural disasters, in this case, fire, Seed can open and close itself on a whim. Interested in an element home of your own? Contact us below to get started! 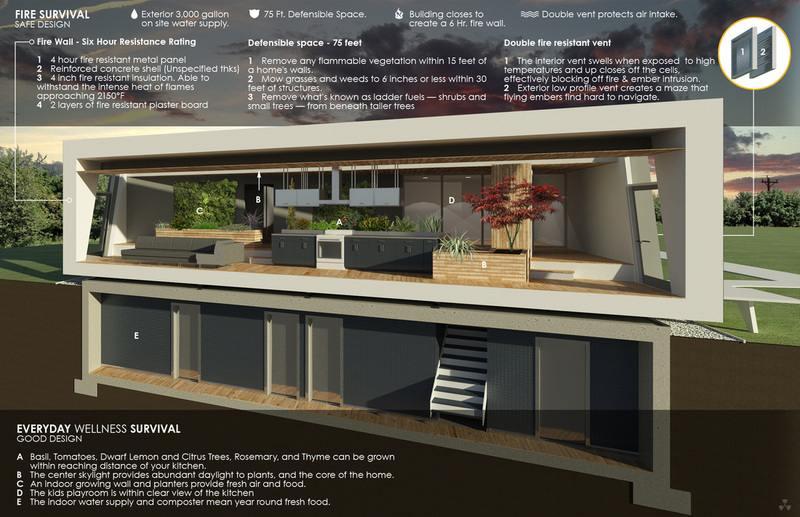 The Elements - Four homes designed to survive the worst earthly conditions possible yet live in style during the best. Protect yourself and your loved ones today and provide them with stylish living by contacting us to talk about an element home designed for you. We can start with one of the above featured designs or create something entirely new based on your needs and desires. 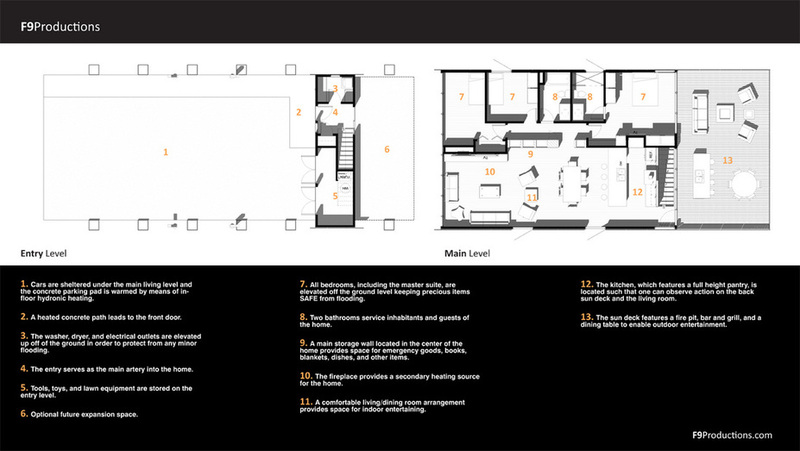 Our experienced residential design team is sure to please and we'd love the opportunity to earn your business.